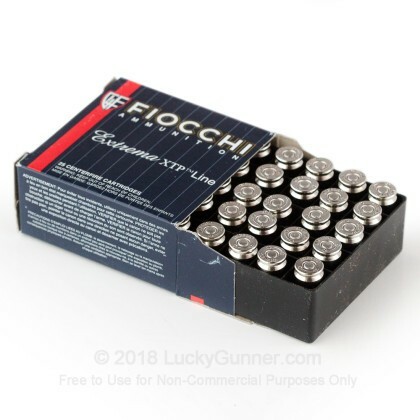 This cost-effective self-defense ammunition from Fiocchi packs a real punch with Hornady's proven XTP bullets. The XTP jacketed hollow point is renowned for its strong penetration, a key trait of any effective carry load. 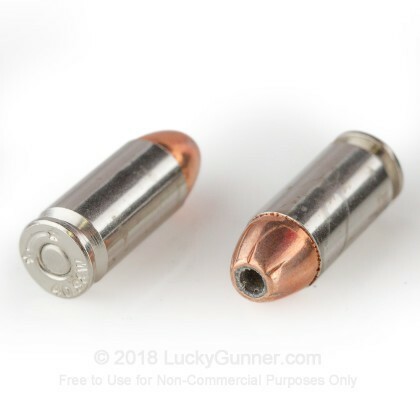 Combine this with the high caliber of the .40 S&W and you can expect excellent expansion and terminal performance should you ever be forced to defend yourself. 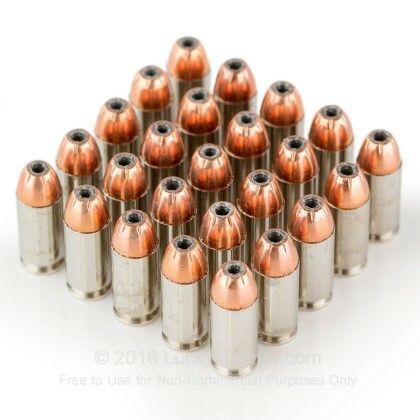 Each cartridge in this box of 25 fires a heavy 180 grain version of the XTP at a muzzle velocity of 950 feet per second. 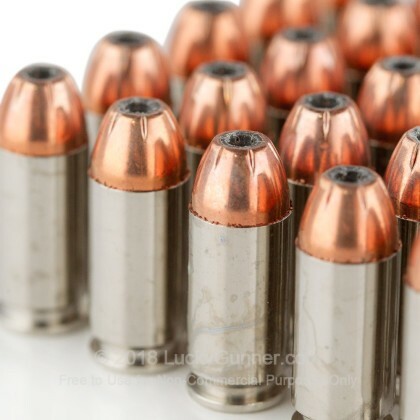 Like most .40 Smith & Wesson loads, this ammo produces stout recoil, so grab a few boxes and train up before you carry it. Fiocchi ammunition is loaded in Ozark, Missouri and Lecco, Italy and uses non-corrosive Boxer primers and brass cases. 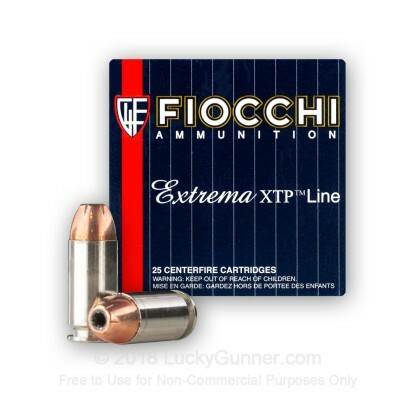 The company's US presence was established in the 1980s and currently manufactures most Fiocchi ammo sold in America. Fiocchi is named for its founding family (which still runs the company) and traces its history in Europe back to the 1870s. We wanted to know exactly what happens to a self-defense handgun bullet on impact, so following FBI protocols, we fired five rounds of Fiocchi 180 gr XTP from 10 feet, through four layers of cloth (to simulate clothing), into synthetic ballistic gelatin. The photos below show the bullets recovered from the gelatin after being fired from a Glock 27 pistol. There’s also a high speed video that shows the bullet impacting the gelatin block. 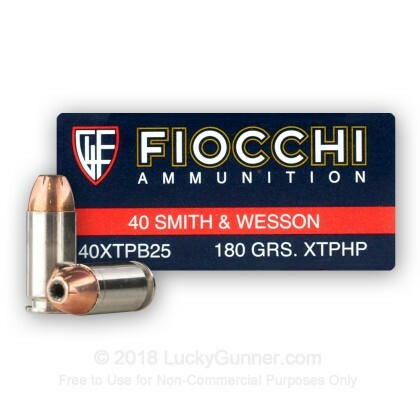 In addition to the .40 S&W (Smith & Wesson) Fiocchi 180 gr XTP, we tested over 100 other self-defense loads, so check out Lucky Gunner Labs for the full story. 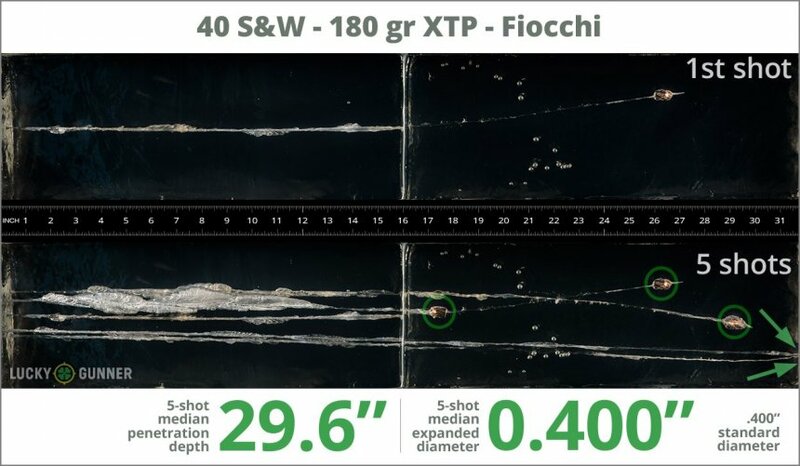 We also have this 40 S&W - 180 Grain XTP Hollow Point - Fiocchi - 500 Rounds ammo in stock in a bigger quantity.